San Francisco supposedly has 43 hills. (I've never counted.) Stunning views can be found throughout the city. Two regular stops on my tours of San Francisco provide beautiful views of San Francisco and the Bay: Telegraph Hill and Twin Peaks. Telegraph Hill, which got its name from a telegraph station (actually a semaphore station) located atop the hill in the 1850s, is in the northeast corner of San Francisco. From the parking lot, you can see from the Golden Gate Bridge to the Bay Bridge. Walk behind Coit Tower and you can see downtown San Francisco and Oakland. Take the elevator to the top of Coit Tower and you get a 360 degree view. On a clear day, it's not to be missed. You can get to the top of Telegraph Hill on the number 39 Muni bus or by walking up the Filbert or Greenwich Street steps. While Twin Peaks at 922 feet above sea level are not the tallest hills in the city, they provide the better view. (Mount Davidson is 6 feet taller but the summit is covered with trees that obstruct the view. Plus, you have to walk to the top of Mount Davidson while you can drive to Twin Peaks.) From the vista point, you can see from the Golden Gate Bridge to the north, across the North and East Bay, all the way to San Bruno Mountain in the south. You can see all of San Francisco except for the southwest corner of the city. From here, you can see many San Francisco landmarks including the Transamerica Pyramid, the Bank of America Building, Coit Tower, City Hall, the rainbow flag at Castro and Market, St. Mary's Cathedral, Golden Gate Park, the Presidio, St. Ignatius Church, Potrero Hill, Bernal Heights, AT&T and Candlestick Parks, and many more. 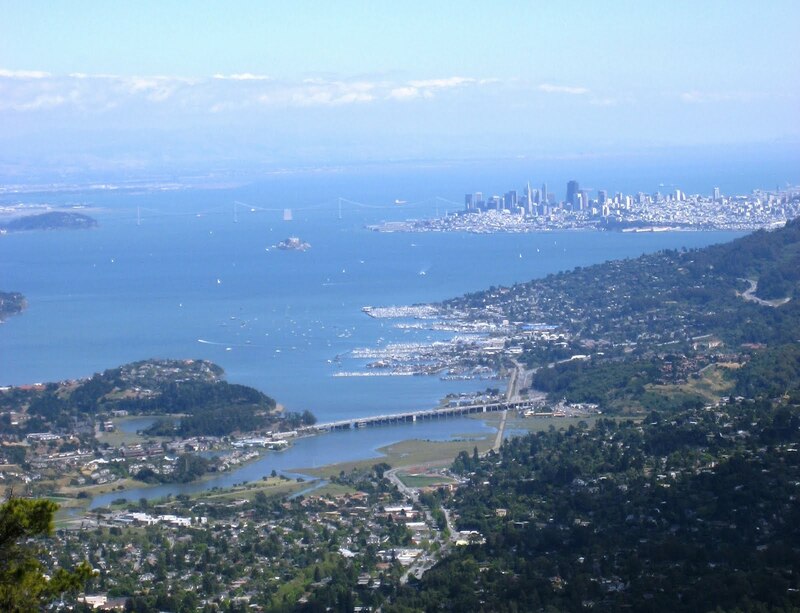 There's no public transportation to Twin Peaks so you'll need to drive, take a taxi, or join one of the many tours (including Blue Heron's) that visit the summit. If you're planning to visit in the summer, make sure the fog is not obstructing the view. Downtown can be sunny while Twin Peaks are shrouded in fog. Look down Market Street to check to see if you can see the radio towers on Twin Peaks. If you the towers are hidden by fog, there won't be a view. If you want to take a private tour of San Francisco that includes visits to Telegraph Hill and Twin Peaks, contact Blue Heron Custom Tours and Travel at (866) 326-4237 (toll free) or Rick@BlueHeronTours.com. Despite being a big fan of the author John Steinbeck, I've never really liked Monterey's Cannery Row, which Steinbeck made famous in his book of the same name. There are too many tacky tourist shops for my taste. However, there is one attraction that is definitely worth visiting -- the Monterey Bay Aquarium. The aquarium is one of the best I've ever been in. I love seeing the sea otters and jelly fish. If you time your visit right, you can watch staff feed the otters. The Splash Zone is a fun exhibit for families with young children. Exhibits change periodically so check the aquarium's website to see what will be on view during your visit. 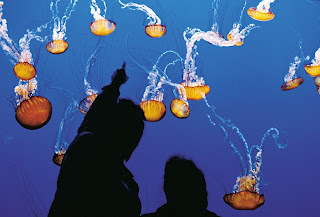 What makes the aquarium special is that most of the plants and animals are native to Monterey Bay. The aquarium is also one of the few aquariums in the world that exchanges water directly with the outside, meaning that fresh water from Monterey flows into the aquarium as other water exits. The aquarium is open daily except on Christmas Day. Hours vary with the season and day of the week. Tickets currently cost $29.95 for adults and $17.95 for children age 3 - 17. If you know the date of your visit, buy your tickets in advance on the aquarium's website so you don't have to worry about waiting in the ticket line. If you would like to visit the Monterey Bay Aquarium as part of a private tour of Monterey and Carmel, contact Blue Heron Custom Tours and Travel at (866) 326-4237 (toll free) or Rick@BlueHeronTours.com.